A table is just a rectangular grid of squares, referred to as cells. 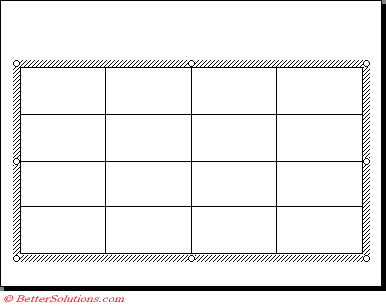 Each horizontal line of cells is known as a row and each vertical line of cells is known as a column. Tables are used to present structured data, particularly numerical which can be easily cross referenced. Tables are a great way to present lots of information in an orderly fashion. Text in a table does not appear in the Outline tab. A table is a great way to organise related data especially pictures or graphics. There are several ways to create a table for use in a Microsoft PowerPoint presentation. You can create tables in PowerPoint, or you can add a table from another program as a linked object or an embedded object. If you want a larger table or more powerful formatting capabilities than those provided by PowerPoint, you can create an embedded Microsoft Word table. For example, Word provides more options for formatting lists, tabs and indents, and individual cells. You can also embed a Microsoft Excel worksheet or a Microsoft Access table. Basic tables are very easy to create in PowerPoint. (Enter) - Starts a new paragraph in the same cell. (Tab) - Moves to the next cell. (Shift + Tab) - Moves to the previous cell. (Ctrl + Tab) - Enters a tab stop inside a table cell. You cannot add any formulas to your tables. The table menu is accessed from the Tables and Borders toolbar and not from the Menu Bar along the top. How do you get a table to span 2 slides without splitting it ?? It is very easy for your tables to become too large or the slide. Any text that appears in a table does not appear in the Outline pane. A common use for a table is to supplement a chart by displaying the actual data behind the chart.